Groupon Canada has a great promotion available now! 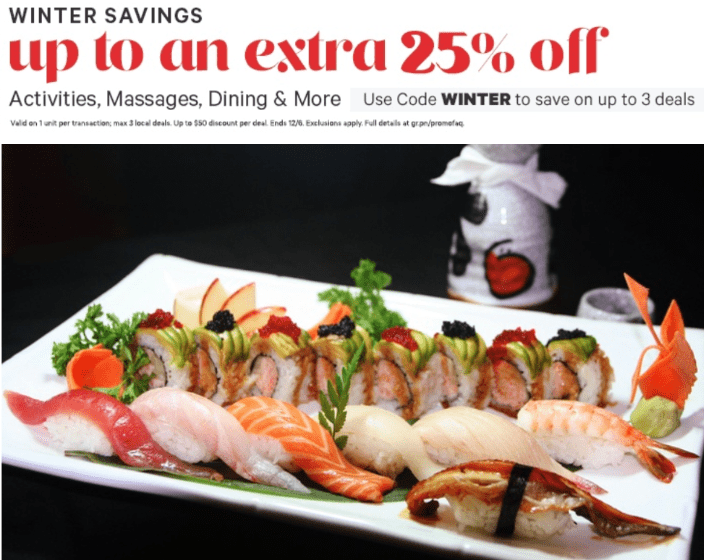 Save an extra 25% off Activities, Massages, Beauty & Spas, Dining and more. To get this deal, enter the promo code WINTER at checkout. This offer is valid until December 6, 2018. Code “Winter” did not work for me — I tried a dozen times to buy the natural direct deal. It kept displaying “Enter a valid United States zip code” when I entered my credit card despite of using the Groupon Canada website. Up to 25% off. 25% off beauty and only 20% off for all other local deals.